Static routing is more secure because it does not advertise over the network. Static routing scales well with expanding networks. Static routing requires very little knowledge of the network for correct implementation. Static routing uses fewer router resources than dynamic routing. Static routing is relatively easy to configure for large networks. Refer to the exhibit. What routing solution will allow both PC A and PC B to access the Internet with the minimum amount of router CPU and network bandwidth utilization? Configure a static route from R1 to Edge and a dynamic route from Edge to R1. Configure a static default route from R1 to Edge, a default route from Edge to the Internet, and a static route from Edge to R1. Configure a dynamic route from R1 to Edge and a static route from Edge to R1. Configure a dynamic routing protocol between R1 and Edge and advertise all routes. What is the correct syntax of a floating static route? 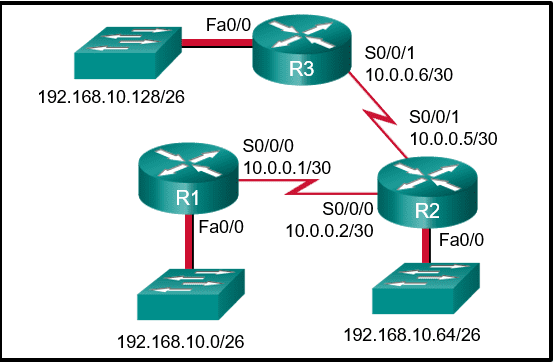 What is a characteristic of a static route that matches all packets? What type of route allows a router to forward packets even though its routing table contains no specific route to the destination network? Why would a floating static route be configured with an administrative distance that is higher than the administrative distance of a dynamic routing protocol that is running on the same router? Which block of addresses would be the minimum to accommodate all of these devices if each type of device was on its own network? What happens to a static route entry in a routing table when the outgoing interface associated with that route goes into the down state? The static route is removed from the routing table. The router polls neighbors for a replacement route. The static route remains in the table because it was defined as static. The router automatically redirects the static route to use another interface. The network administrator configures the router with the ip route 172.16.1.0 255.255.255.0 172.16.2.2 command. How will this route appear in the routing table? 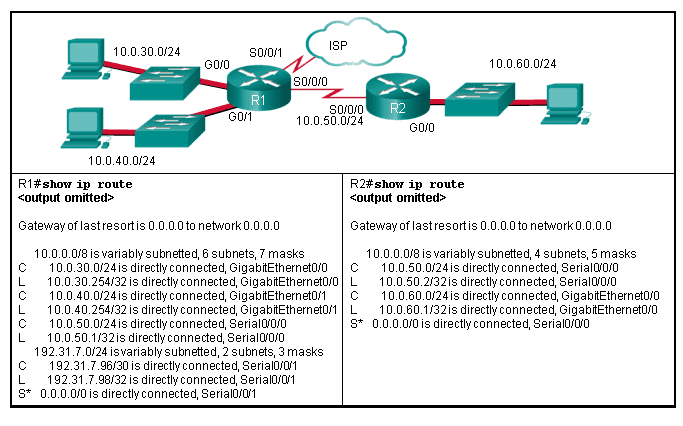 Which type of static route that is configured on a router uses only the exit interface? Refer to the graphic. 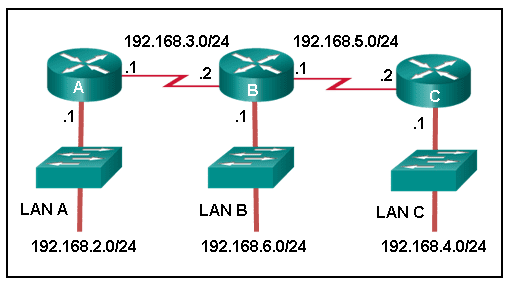 Which command would be used on router A to configure a static route to direct traffic from LAN A that is destined for LAN C? Refer to the exhibit. The network administrator needs to configure a default route on the Border router. Which command would the administrator use to configure a default route that will require the least amount of router processing when forwarding packets? Refer to the exhibit. What command would be used to configure a static route on R1 so that traffic from both LANs can reach the 2001:db8:1:4::/64 remote network? Refer to the exhibit. Which default static route command would allow R1 to potentially reach all unknown networks on the Internet? 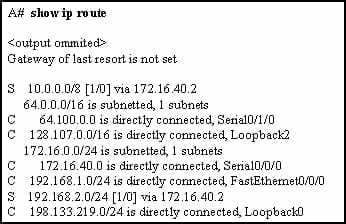 Which route would have to go down in order for this static route to appear in the routing table? What will router R2 do with a packet destined for 192.168.10.129? A network administrator has entered a static route to an Ethernet LAN that is connected to an adjacent router. However, the route is not shown in the routing table. Which command would the administrator use to verify that the exit interface is up? How would an administrator test this configuration? Delete the default gateway route on the router. Ping any valid address on the 192.168.10.0/24 network. Manually shut down the router interface used as a primary route. Ping from the 192.168.10.0 network to the 10.10.10.2 address. Refer to the exhibit. The small company shown uses static routing. Users on the R2 LAN have reported a problem with connectivity. What is the issue? R2 needs a static route to the R1 LANs. R1 and R2 must use a dynamic routing protocol. R1 needs a default route to R2. R1 needs a static route to the R2 LAN. R2 needs a static route to the Internet. An administrator issues the ipv6 route 2001:db8:acad:1::/32 gigabitethernet0/0 2001:db8:acad:6::1 100 command on a router. What administrative distance is assigned to this route? Refer to the exhibit. The network engineer for the company that is shown wants to use the primary ISP connection for all external connectivity. The backup ISP connection is used only if the primary ISP connection fails. Which set of commands would accomplish this goal? Why are the pings from PC0 to Server0 not successful? The static route to network 192.168.1.0 is misconfigured on Router1. 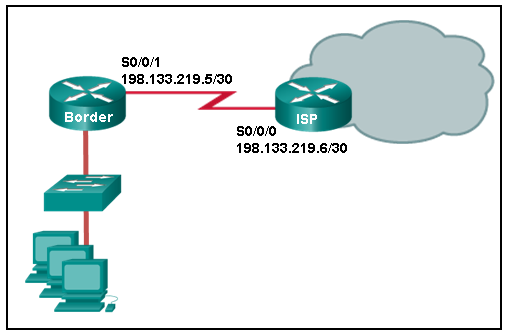 What IPv6 static route can be configured on router R1 to make a fully converged network?